The Wall Street Journal reported yesterday that the White House is crafting a plan for $1 trillion in infrastructure investment. I was intrigued to learn that President Trump “inquired about the possibility of auctioning the broadcast spectrum to wireless carriers” to help fund the programs. Spectrum sales are the rare win-win-win: they stimulate infrastructure investment (cell towers, fiber networks, devices), provide new wireless services and lower prices to consumers, and generate billions in revenue for the federal government. Broadcast TV spectrum is good place to look for revenue but the White House should also look at federal agencies, who possess about ten times what broadcasters hold. Large portions of spectrum are underused or misallocated because of decades of command-and-control policies. Auctioning spectrum for flexible uses, on the other hand, is a free-market policy that is often lucrative for the federal government. Since 1993, when Congress authorized spectrum auctions, wireless carriers and tech companies have spent somewhere around $120 billion for about 430 MHz of flexible-use spectrum, and the lion’s share of revenue was deposited in the US Treasury. A few weeks ago, the FCC completed the $19 billion sale of broadcast TV spectrum, the so-called incentive auction. Despite underwhelming many telecom experts, this was the third largest US spectrum auction ever in terms of revenue and will transfer a respectable 70 MHz from restricted (broadcast TV) use to flexible use. The remaining broadcast TV spectrum that President Trump is interested in totals about 210 MHz. But even more spectrum is under the President’s nose. 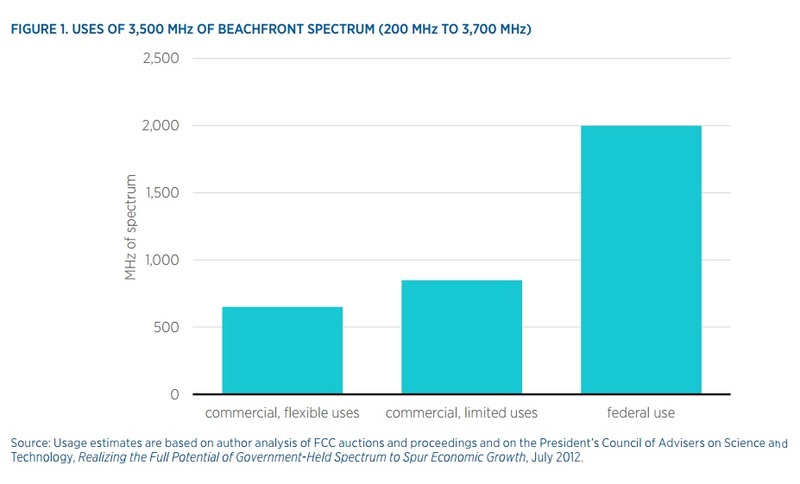 As Obama’s Council of Advisors on Science and Technology pointed out in 2012, federal agencies possess around 2,000 MHz of “beachfront” (sub-3.7 GHz) spectrum. I charted various spectrum uses in a December 2016 Mercatus policy brief. This government spectrum is very valuable if portions can be cleared of federal users. Federal spectrum was part of the frequencies the FCC auctioned in 2006 and 2015, and the slivers of federal spectrum (around 70 MHz of the federal total) sold for around $27 billion combined. The Department of Commerce has been analyzing which federal spectrum bands could be used commercially and the Mobile Now Act, a pending bill in Congress, proposes more sales of federal spectrum. These policies have moved slowly (and the vague language about unlicensed spectrum in the Mobile Now bill has problems) but the Trump administration has a chance to expedite spectrum reallocation processes and sell more federal spectrum to commercial users. The proposed Mobile Now Act signals that spectrum policy is being prioritized by Congress and there’s some useful reforms in the bill. However, the bill encourages unlicensed spectrum allocations in ways that I believe will create major problems down the road. Congress and the FCC need to proceed much more carefully before allocating more unlicensed spectrum. The FCC’s 2008 decision, for instance, to allow unlicensed devices in the “TV white spaces” has been disappointing. As some economists recently noted, “[s]imply stated, the FCC’s TV white space policy to date has been a flop.” Unlicensed spectrum policy is also generating costly fights (see WiFi v. LTE-U, Bluetooth v. TLPS, LightSquared v. GPS) as device makers and carriers lobby about who gains regulatory protection and how to divide this valuable resource that the FCC parcels out for free. make available on an unlicensed basis radio frequency bands sufficient to meet demand for unlicensed wireless broadband operations if doing so is…reasonable…and…in the public interest. Note that we have language about supply and demand here. But unlicensed spectrum is free to all users using an approved device (that is, nearly everyone in the US). Quantity demanded will always outstrip quantity supplied when a valuable asset (like spectrum or real estate) is handed out when price = 0. By removing a valuable asset from the price system, large allocation distortions are likely. Any policy originating from Congress or the FCC to satisfy “demand” for unlicensed spectrum biases the agency towards parceling out an excessive amount of unlicensed spectrum. The problems from unlicensed spectrum allocation could be mitigated if the FCC decided, as part of a “public interest” conclusion, to estimate the opportunity cost of any unlicensed spectrum allocated. That way, the government will have a rough idea of the market value of unlicensed spectrum being given away. There have been several auctions and there is an active secondary market for spectrum so estimates are achievable, and the UK has required the calculation of the opportunity cost of spectrum for over a decade. With these estimates, it will be more difficult but still possible for the FCC to defend giving away spectrum for free. Economist Coleman Bazelon, for instance, estimates that the incremental value of a nationwide megahertz of licensed spectrum is more than 10x the equivalent unlicensed spectrum allocation. Significantly, unlike licensed spectrum, allocations of unlicensed bands are largely irreversible. People can quibble with the estimates but it is unclear that unlicensed use is the best use of additional spectrum. In any case, hopefully the FCC will attempt to bring some economic rigor to public interest determinations. Did the Incentive Auction Fail? Is the incentive auction a disappointment? For consumers, this auction is not a disappointment. At least–not yet. By my count, this was the eighth major auction of commercial, flexible-use spectrum since auctions were authorized in 1993. On the most important question–how much spectrum was repurposed from restricted uses to flexible, licensed uses?–this auction stacks up pretty well. At 70 MHz, this was the third largest auction in terms of total spectrum repurposed, trailing the mid-1990s PCS auction (120 MHz) and 2006 AWS-1 auction (90 MHz). On the next most important question–how quickly will new services be deployed?–the verdict is still out. Historically, repurposing spectrum like this typically takes six to twelve years. Depending on how you classify it, this proceeding commenced in 2010 (when the FCC proposed the incentive auction) or 2012 (when Congress authorized the auction). With the auction over, broadcasters have over three years to clear out of the spectrum but some believe it will take longer. Right now, it looks like the process will take seven to eleven years total–not great but pretty typical. Some people are disappointed, however, with this auction, particularly some in the broadcasting industry and in the FCC or Congress, who expected higher auction revenues. High revenue gets nice headlines but is far less important than the amount of spectrum repurposed. It’s an underreported story but close to 290 MHz of spectrum, nearly 45% of all liberalized, licensed spectrum, was de-zoned by the FCC, not auctioned. De-zoning spectrum generates zero auction revenue for the government but consumers see substantial benefits from this de-zoning, even if the government does not directly benefit. I recently wrote a policy brief about the benefits of de-zoning spectrum. In any case, in terms of revenue, this auction was not a failure. At around $17 billion, it’s third out of eight, trailing the 2008 700 MHz band auction (about $21 billion in 2015 dollars) and the massive haul from the 2015 AWS-3 auction (about $42 billion). At close, broadcasters will receive $10 billion for the 70 MHz of available licensed spectrum. Some broadcasters consider it a failure, just as a home seller is disappointed when her home sells below list price. The broadcasters initially requested $86 billion for 100 MHz of available spectrum. When the carriers’ bids didn’t match that price, some broadcasters pulled out and the remaining broadcasters lowered their price. Were there better ways of repurposing broadcast spectrum? Broadcasters have a point that the complexity of the auction might have reduced buyer and seller participation (which means lower bids and fewer deals). As Wallsten notes, an overlay auction (like AWS-1) or simply de-zoning the spectrum might have been better (faster) alternatives. But it goes too far deem this auction a failure (at least until we know how long the broadcaster repack takes). Will LTE-U Mark the End of the Unlicensed Spectrum Commons? Those of us with deep reservations about the push for ever more unlicensed spectrum are having many of our fears realized with the new resistance to novel technologies using unlicensed spectrum. By law unlicensed spectrum users have no rights to their spectrum; unlicensed spectrum is a managed commons. In practice, however, existing users frequently act as if they own their spectrum and they can exclude others. By entertaining these complaints, the FCC simply encourages NIMBYism in unlicensed spectrum. The general idea behind unlicensed spectrum is that by providing a free spectrum commons to any device maker who complies with certain simple rules (namely, Part 15’s low power operation requirement), device makers will develop wireless services that would never have developed if the device makers had to shell out millions for licensed spectrum. For decades, unlicensed spectrum has stimulated development and sale of millions of consumer devices, including cordless phones, Bluetooth devices, wifi access points, RC cars, and microwave ovens. Now, however, many device makers are getting nervous about new entrants. For instance, Globalstar is developing a technology, TLPS, based on wifi standards that will use some unlicensed spectrum at 2.4 GHz and mobile carriers would like to market an unlicensed spectrum technology, LTE-U, based on 4G LTE standards that will use spectrum at 5 GHz. The most pressing challenge in wireless telecommunications policy is transferring spectrum from inefficient legacy operators like federal agencies to the commercial sector for consumer use. Reflecting high consumer demand for more wireless services, in early 2015 the FCC completed an auction for a small slice of prime spectrum–currently occupied by federal agencies and other non-federal incumbents–that grossed over $40 billion for the US Treasury. Increasing demand for mobile services such as Web browsing, streaming video, the Internet of Things, and gaming requires even more spectrum. Inaction means higher smartphone bills, more dropped calls, and stuttering downloads. Spectrum NIMBYs and the Return of FCC Beauty Contests? The FCC is being dragged–reluctantly, it appears–into disputes that resemble the infamous beauty contests of bygone years, where the agency takes on the impossible task of deciding which wireless services deliver more benefits to the public. Two novel technologies used for wireless broadband–TLPS and LTE-U–reveal the growing tensions in unlicensed spectrum. The two technologies are different and pose slightly different regulatory issues but each is an attempt to bring wireless Internet to consumers. Their advocates believe these technologies will provide better service than existing wifi technology and will also improve wifi performance. Their major similarity is that others, namely wifi advocates, object that the unlicensed bands are already too crowded and these new technologies will cause interference to existing users. The LTE-U issue is new and developing. The TLPS proceeding, on the other hand, has been pending for a few years and there are warning signs the FCC may enter into beauty contests–choosing which technologies are entitled to free spectrum–once again. Many readers will recall the telecom soap opera featuring the GPS industry and LightSquared and the subsequent bankruptcy of LightSquared. Economist Thomas W. Hazlett (who is now at Clemson, after a long tenure at the GMU School of Law) and I wrote an article published in the Duke Law & Technology Review titled Tragedy of the Regulatory Commons: Lightsquared and the Missing Spectrum Rights. The piece documents LightSquared’s ambitions and dramatic collapse. Contrary to popular reporting on this story, this was not a failure of technology. We make the case that, instead, the FCC’s method of rights assignment led to the demise of LightSquared and deprived American consumers of a new nationwide wireless network. Our analysis has important implications as the FCC and Congress seek to make wide swaths of spectrum available for unlicensed devices. Namely, our paper suggests that the top-down administrative planning model is increasingly harming consumers and delaying new technologies. Read commentary from the GPS community about LightSquared and you’ll get the impression LightSquared is run by rapacious financiers (namely CEO Phil Falcone) who were willing to flaunt FCC rules and endanger thousands of American lives with their proposed LTE network. LightSquared filings, on the other hand, paint the GPS community as defense-backed dinosaurs who abused the political process to protect their deficient devices from an innovative entrant. As is often the case, it’s more complicated than these morality plays. We don’t find villains in this tale–simply destructive rent-seeking triggered by poor FCC spectrum policy. Adam and I recently published a Mercatus research paper titled Video Marketplace Regulation: A Primer on the History of Television Regulation And Current Legislative Proposals, now available on SSRN. I presented the paper at a Silicon Flatirons academic conference last week. We wrote the paper for a policy audience and students who want succinct information and history about the complex world of television regulation. Television programming is delivered to consumers in several ways, including via cable, satellite, broadcast, IPTV (like Verizon FiOS), and, increasingly, over-the-top broadband services (like Netflix and Amazon Instant Video). Despite their obvious similarities–transmitting movies and shows to a screen–each distribution platform is regulated differently. The television industry is in the news frequently because of problems exacerbated by the disparate regulatory treatment. The Time Warner Cable-CBS dispute last fall (and TWC’s ensuing loss of customers), the Aereo lawsuit, and the Comcast-TWC proposed merger were each caused at least indirectly by some of the ill-conceived and antiquated TV regulations we describe. Further, TV regulation is a “thicket of regulations,” as the Copyright Office has said, which benefits industry insiders at the expense of most everyone else. These objectives can’t be accomplished simultaneously without substantial regulatory mandates. Further, these social goals may even contradict each other in some respects. For decades, public policies constrained TV competitors to accomplish those goals. We recommend instead a reliance on markets and consumer choice through comprehensive reform of television laws, including repeal of compulsory copyright laws, must-carry, retransmission consent, and media concentration rules. At the very least, our historical review of TV regulations provides an illustrative case study of how regulations accumulate haphazardly over time, demand additional “correction,” and damage dynamic industries. Congress and the FCC focused on attaining particular competitive outcomes through industrial policy, unfortunately. Our paper provides support for market-based competition and regulations that put consumer choice at the forefront. The FCC is set to vote later this month on rules for the incentive auction of spectrum licenses in the broadcast television band. These licenses would ordinarily be won by the highest bidders, but not in this auction. The FCC plans to ensure that Sprint and T-Mobile win licenses in the incentive auction even if they aren’t willing to pay the highest price, because it believes that Sprint and T-Mobile will expand their networks to cover rural areas if it sells them licenses at a substantial discount.